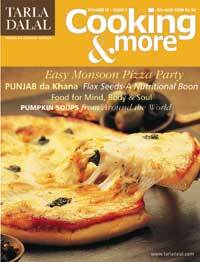 A issue full of recipes and entertaining ideas for this wet season. Parties are always fun in the monsoon when it’s too wet to venture outdoors. I’ve discovered that pizza parties are a great hit with adults and children alike. Biting into warm crusty pizzas dripping with melting cheese is a wonderful experience. Welcome the monsoon with some soup! Try one of the international recipes for pumpkin soup in this issue. I also recommend the vegetarian Chili Con Carne that a visiting Frenchman introduced us to recently. Readers in Mumbai will enjoy a visit to Barbecue Nation, a trendy restaurant that allows you to barbecue your food at the table! The health quotient of our issue is reflected in the sugar free recipe for Maharashtrian delicacy Puranpoli, and the introduction to flax seeds. Most people haven’t heard of these wonder seeds but they pack a nutritional punch. I make it a point to add them to my porridge at breakfast time.